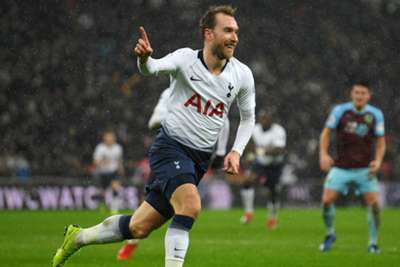 Christian Eriksen struck in injury time to give Tottenham a 1-0 Premier League victory over Burnley on Saturday. The visitors' time-wasting tactics were beginning to irritate the Spurs fans and players, but when Lamela finally had another clear opening 16 minutes from time, Hart again responded with a fine one-handed save. With City having beaten Everton earlier on Saturday, Spurs really needed to seal three points in London to keep the pressure on the leaders and Liverpool, who face Manchester United on Sunday. As it turned out, they looked lethargic after their Champions League heroics, even amid the changes in personnel, and offered very little consistent threat to Hart's goal despite having 71 per cent of the possession. However, Eriksen once more proved the difference, moving his side five points above Chelsea and Arsenal, having played a game more. Burnley, meanwhile, stay two points outside the relegation zone. Tottenham only managed three efforts on target: two of them were saved expertly by Hart, and the third was a goal he could do little about. The England goalkeeper did not deserve to be on the losing side. Kane took exception to some of Burnley's delaying tactics, and his frustrations were reflected in a poor display at the spearhead of the attack, even if he did manage an assist. - None of Tottenham's last 21 Premier League games have ended level, with Spurs winning 16 and losing five since a 1-1 draw at Brighton in April. - Only Bolton Wanderers, in 2011-12 (18), have had a longer run without a draw from the start of a Premier League campaign than Spurs this season (17). - Burnley failed to register a single shot on target in this match. It’s the third time they've done this in the Premier League this term – no other side has done so more than once. Spurs now turn their attention to a derby trip to Arsenal in the EFL Cup on Wednesday, before they resume league duties away at Everton. Burnley have a week off ahead of their own visit to the Gunners.